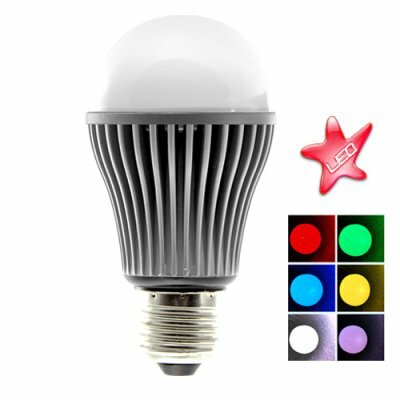 Successfully Added LED Color Changing Light Bulb with Remote (5W) to your Shopping Cart. LED color changing light bulb with remote for use in any standard incandescent socket. The newest offering in our famous series of color changing LED lights. This new 5 watt LED Color Changing Light Bulb with Remote is brighter than our previous 3W models and has a new style remote that allows for dimming. And as always, this multi-color LED light bulb conveniently fits into any incandescent light socket. Do you have a sign, wall or room currently illuminated with boring white light? Own a small business and want to really make your space stand out? Well here is the lighting product you have been waiting for - the new 5 watt LED Color Changing Light Bulb with Remote! This LED light can be used in a single static (fixed) color or simply press the remote control to changing colors. The CVGC-G232 is capable of emitting White, Red, Green, Blue, plus three additional bright colors. In addition to the brilliant colors you can produce with this light bulb, you have the added benefit of reducing your energy costs since this bulb uses only 5 watts of energy. Great for retrofitting into existing track lights, downlights, pendants, wall sconces, or table lamps, make your interior decorations and displays shine with this one of a kind LED color changing RGB light bulb brought to you direct from the factory. In stock and available for single piece or bulk quantity orders, get yours today and be ready to impress friends or customers with your new high-tech LED light! Uses only 5 watts of power! Can I use one remote to control all the LED light bulbs? Yep. Also, the remote is extremely accurate, so you have the ability to target a single bulb when multiple are next to each other. Can I use this in my desk lamp? Yes. It can be used in any lighting fixture with a standard screw base, including a desktop lamp. Can I use this in my home? Certainly! If you want to use it as a mood light in your bedroom then go ahead and have fun!